If you are looking for a way to add an important link to your Canvas course menu, then the Redirect Tool can be used. The Redirect Tool app settings are decided by you and the link can point to an external URL, an internal Canvas page, resource or activity. The link can open in Canvas or in a new tab. 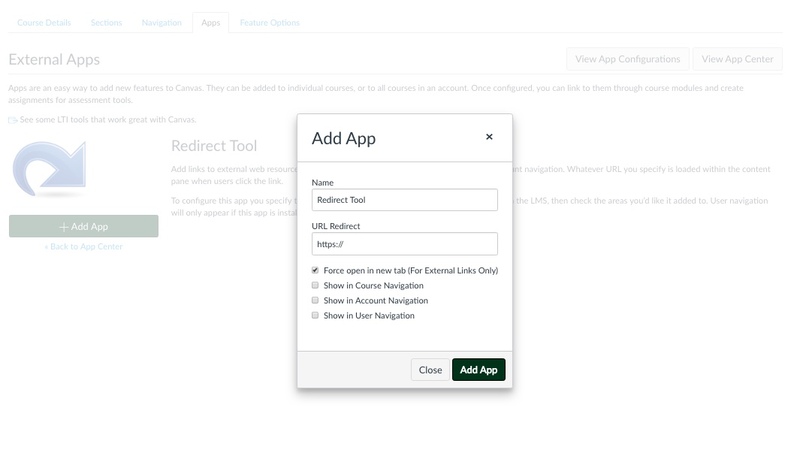 The Redirect Tool app already exists in all Tulane course sites and you can configure multiple apps. Select Settings on the course menu. On the Apps page, click the Redirect Tool icon (or input Redirect Tool in the search filter). Input your settings in the Add App window. URL Redirect – the internal or external url. choose whether the link should open in a new window (recommended for external websites). Select Show in Course Navigation. Return to your course Homepage > Course Menu and select your new Redirect Tool menu item to confirm the link is opening to the correct source.